Ali Pasha (1740- January 24, 1822) , variously referred to as “of Tepelana” or “of Ioannina”, Aslan/”the Lion” was an Albanian Muslim ruler who served as an Ottoman Pasha of the Western Part of Rumelia – the Ottoman Empire’s European territory, and was referred to as the “Pashalik of Yanina” (Ioannina in the Hellenic). 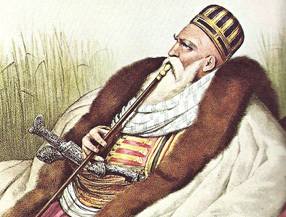 As ruler of Ioannina, he was one of the the most interesting and powerful semi-independent despots in the Balkans from the mid 18th to the early 19th Century and beyond. At the height of his power, he controlled and governed Epirus and current Southern Albania , Western parts of Thessaly and Macedonia in Northern Hellas and through his sons Veli Pasha and Salih Pasha effectively controlled the Morea/Peloponnisos and Vlore. Taking advantage of a weak Ottoman government, he seized and expanded territory through a series of shifting alliances, consistently dictated by whoever offered the most advantage to him at the time – be it forming alliances with Napolean to gain a seaport on the Ionian coast, or reversing himself after Napolean’s Treaty of Tilsett with the Czar, to ally himself with the United Kingdom. Ali’s military might consisted of a polyglot of forces – Skipetars/ Albanians, Hellenic Armatoli, Tartar cavalry Moors and Turks. Lord Byron visited Ali’s court in Ioannina in 1809 and imoortalized it in his work “Childe Harold”. He noted besides the mixed feelings about Ali specifically, that the splendor of his court was “superior in wealth, refinement and learning” to any other Hellenic town. Ali Pasha is a complex and paradoxical figure. He was known for his diplomatic and administrative skills (including setting up a sophisticated system of intelligence gathering), his interest in modern ideas and concepts, his legendary cunning, his religious neutrality, his vengefulness and harshness, and his looting of peoples and communities for personal gain. He generated both admiration and criticism by his contemporaries. The controversy continues today among historians of all stripes (Hellenic, Albanian and Turkish). He is known as much for his achievements as he is for his atrocities – at Gardhiki and Hormova, executing in public the Hellenic Klepht Katsantonis,etc., and the mass (and arbitrary) murder of Hellenic girls of Ioannina. These events have been immortalized in a large body of folk songs and poetry. Louis Katsos, President/Founder EMBCA with a short talk on “Ali Pasha, Souliotes, and the start of the Hellenic Revolution”. Katherine Elizabeth Fleming – NYU Provost and the Alexander S. Onassis Professor of Hellenic Culture and Civilization in the Department of History at New York University .and author (among others) of The Muslim Bonaparte: Diplomacy and Orientalism in Ali Pasha’s Greece. Elektra Kostopoulou, Rutgers University Department of History/ Program in Modern Greek Studies and author (among others) of “Autonomy and Federation Within the Ottoman Empire”. Julie Ziavras, Soprano with musical accompaniment.